Preventing infection after surgery is very important as not only are these infections often uncomfortable and make you feel very sick, but they also increase the risk of more serious complications for example, if you are less mobile because of an infection after surgery you are at higher risk for a blood clot or if you need a prolonged hospitalization because of an infection in your surgical wound you are at risk of catching another infection while you are in the hospital. 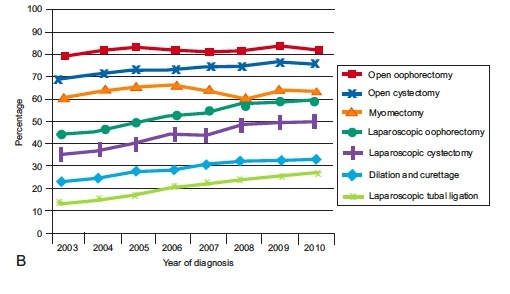 On average an infection related to surgery add four days of hospitalization. Some people will die either directly from the infection or indirectly (for example, from the second infection resistant to most antibiotics that they caught while re-admitted to the hospital with a wound infection). These infections are also costly, a single post operative infection ads on average $10,000 to the surgical price tag. Antibiotics can help prevent infections after some surgeries. For example, after a hysterectomy antibiotics reduce the risk of infection by 65%. Some surgeries are so low risk infection-wise that antibiotics make no difference so there is greater harm in giving them. Remember, there can be catastrophic fall out from inappropriate use of antibiotics. So it’s a balancing act and antibiotics should only be given when there is clear evidence the benefit outweighs the harm. Despite lots of educational efforts for surgeons and hospitals and clear published guidelines when it comes to GYN surgery women aren’t always getting what is recommended or are often getting antibiotics when they don’t need them at all. One recent review (Wright et al, Obstet Gynecol 2013) looked at over a million GYN surgeries, antibiotics were recommended for about half of the procedures and they were not for the other half (based on national guidelines) and it tells an interesting tale of what is really happening. When antibiotics were clearly indicated by national guidelines 87.1% of women received the right antibiotic, 2.3% received a non-guideline antibiotic (not necessarily wrong as some patients have so many allergies that all you have left is a non-guideline choice), and 10.6% didn’t receive antibiotics at all (definitely wrong). Equally concerning (or perhaps even more concerning) was the use of antibiotics when there were clear guidelines saying no antibiotics. In this review of almost 500,000 GYN surgeries 40.2% of women received antibiotics when they were clearly not indicated. I know, 40%! Surgery that resulted in removing an ovary, and ovarian cyst, or fibroid (myomectomy). had the highest rate of inappropriate antibiotic use. 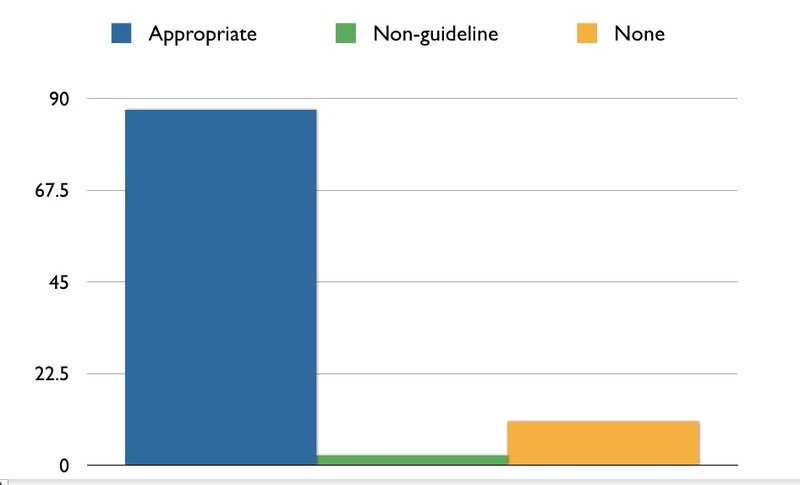 This chart from the study by Wright breaks it down by procedure. So why are so many women getting unindicated antibiotics and why are some people still not getting antibiotics where clearly indicated? It’s hard to know for sure, however, quality measures for getting antibiotics can have unintended consequences and in the panic to make sure the right people get antibiotics everyone gets them. Also some people just don’t know the guidelines or know them and just believe they don’t apply to this particular patient (both sad). I also think some surgeons when faced with a more complicated patient or surgery think extra antibiotics will help. And finally there are probably medicolegal reasons, the belief that perhaps a lawsuit will be less likely if antibiotics are given, however, a complication from a unindicated antibiotic could also result in a lawsuit. So what is a patient to do? Be empowered. 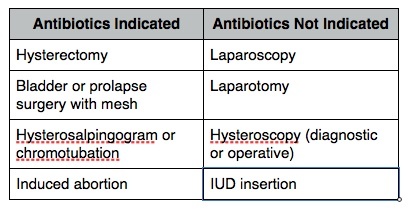 If you are having GYN surgery ask your doctor if antibiotics are indicated and make sure their recommendation follows the ACOG guidelines (see table below). On the day of the surgery double check with the nurse and your surgeon about the antibiotics. It’s a lot to remember, but as long as studies tell us so many women are getting antibiotics they don’t need and a significant percentage are still not getting them it’s a necessary step. Getting antibiotics when you don’t need them doesn’t mean your doctor cares more or is being extra cautious, in fact it means the opposite. What are the guidlines for planned and emergency C-sections? This is very important information. I’m thinking of my daughters and their friends, in particular. “Antibiotics can help prevent infections after some surgeries. For example, after a hysterectomy antibiotics reduce the risk of infection by 65%. Some surgeries are so low risk infection-wise that antibiotics make no difference so there is greater harm in giving them. Remember, there can be catastrophic fall out from inappropriate use of antibiotics. So it’s a balancing act and antibiotics should only be given when there is clear evidence the benefit outweighs the harm,” per Dr. Jen Gunter. Yes i agree with this post. Thanks for sharing information. If there is side effects of any antibiotics that will be good as per doctors suggested.